Release Date: November 10th, 2006 by Roadside Attractions. The Cast: Ashley Judd, Jeffrey Donovan, Diane Ladd, Tim Blake Nelson, Scott Wilson, Laura Prepon, Ray McKinnon. Directed by Joey Lauren Adams. BASIC PREMISE: In a small southern town, Lucy (Judd) struggles to maintain a stable relationship with her new boyfriend, Cal (Donovan), while battling alcoholism. ENTERTAINMENT VALUE: Despite a strong performance by Ashley Judd as the often drunk Lucy, Come Early Morning has a meandering plot with dull characters. Lucy suffers from hangovers every morning and can’t commit to a serious relationship, nor can she even remember the name of the men she slept with. Throughout the thin plot, she gradually changes into a more serious, stable and sober woman, especially after she meets Cal. In a poorly developed subplot, she’s estranged from her stubborn father (Wilson). The romance between Cal and Lucy feels rather forced--they simply don’t have any chemistry onscreen. First-time writer/director Joey Lauren Adams does an admirable job of keeping the dialogue realistic and, through terrific choices for settings, captures the genuine low-key, down-to-earth atmosphere of a small southern town. Unfortunately, she forgets to add some humor or any other kind of liveliness to boost the film with some much-needed energy that would have helped to keep you engaged. It’s clear that Adams takes her characters seriously, but it would have been nice if they stood out in some way. Without enough drama, comedy, suspense, or believable romance, Come Early Morning ultimately feels bland and underwhelming. Ashley Judd’s radiant performance saves the film from being a complete bore. INSULT TO YOUR INTELLIGENCE: A meandering plot, dull characters and a lack of romantic chemistry. 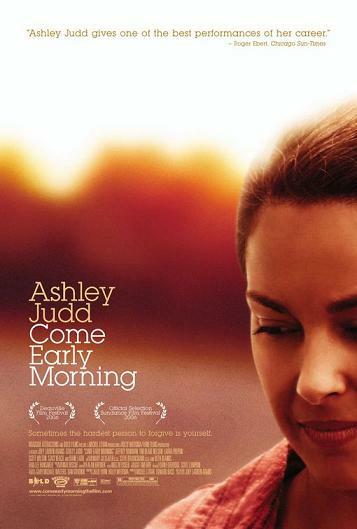 IN A NUTSHELL: Ashley Judd shines in a bland, meandering plot with dull characters and no romantic chemistry.